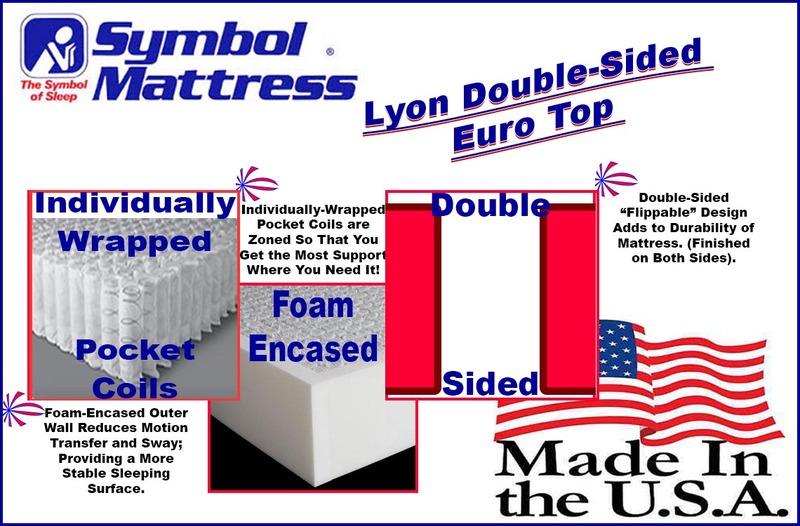 The "Lyon Double-Sided Euro Top" is an American-Made, CertiPUR-US (non-toxic) soft, though supportive, mattress. Like the long-lasting mattresses of old, it's double-sided - adding to its durability. Combined with the design and craftsmanship of mattresses of earlier generations; there are also plenty state-of-the-art features to the Lyon, as well. Its individually wrapped pocketed coil nearly elminates all motion transfer, its high density GEL and Air Flow foam layers help to keep your sleep surface cool, and its high density comfort foam layers all combine to provide a soft but supportive sleeping experience. 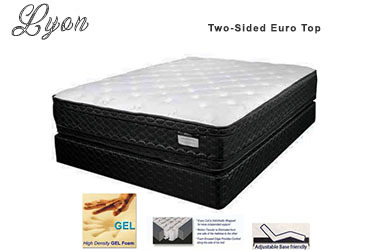 With the Lyon, you'll also enjoy an organic cotton cover and Symbol's ten year non-prorated warranty. Additionally, this mattress features a strong edge support (foam encasement) that not only gives you a stronger edge but that works in accordance with the pocket coil system to decrease the energy of the motion transfer when someone enters or exits the bed. With many of Symbol's products, I feel like I'm repeating myself at times. My opinion on the "Lyon Double-Sided mattress" is no exception to what I've come to say many times: This Symbol Mattress product has a low price that is hard to beat, given the great features that it offers. Coming in at under $700, (queen price) the Lyon packs a value that's hard to beat. It's two-sided (as its title indicates) so you're likely to get more wear-and-tear out of this model than you would from no-flip models in the same feel range. GEL and Air Flow foam layers help to dissipate heat, and the reasonably high coil count pocket coil system provides a stable and contouring support system. There is a sufficient build-up of soft/plush layers on each side to provide you a cushiony sensation that will surely help to induce sleep. The organic cotton cover is definitely a plus, as is the stabilization of a foam encased perimeter. If it's a softer feel that you seek and you are looking for a luxury feel that will outlast most mattresses on the market, the Lyon is a great pick. If you'd like to go even a notch softer and can accomodate a 16" mattress, have a look at the Extra Soft Two-Sided Mattress with Gel by Symbol Mattress: The Copenhagen or for a single sided version of the Lyon we have the Azalea Pillow Top Pocket Coil Mattress.